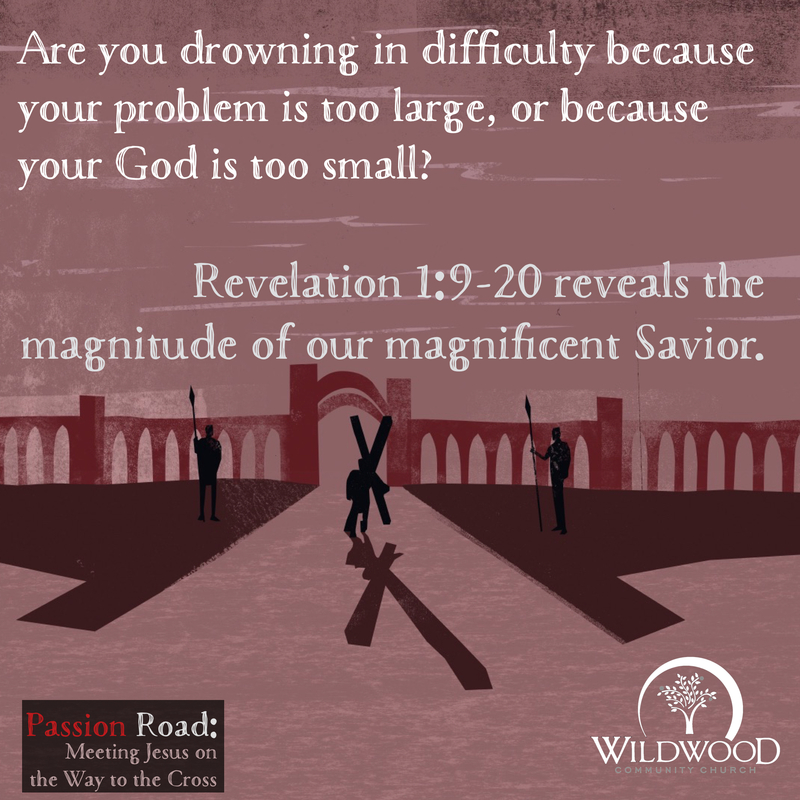 These devotionals relate to the book of Revelation. As many of you are aware, I concluded a short two part sermon series this past week at Wildwood entitled, “M+”. In this series, we were looking more in depth at the events that will occur in the first 1,000 years after the return of Jesus Christ to the earth, as described in Revelation 20-21. I have had a lot of dialogue with many of you about this short series, so I have decided to post the audio from the sermons here on my blog, as well as write a few questions for further reflection in case you or your small group are interested in exploring the idea further. May God bless your study of His Word! Our lives are very short compared to eternity. In other words, we will spend much more “time” on the other side of the grave than in this life. As a result, I make the comment that we should spend some time planning for our life after death. Do you spend much time thinking about life after death? If you do, what are your thoughts? Scared? Uncertain? Excited? Indifferent? In 20:11-15, the Great White Throne Judgment is described. All humanity stands before the throne and are judged on the basis of “what they have done.” Many times people push back toward the concept of God’s judgment because they think it is unfair. Do you feel it is fair or unfair for God to judge humanity on the basis of our works? Why or why not? Though judgment comes on the basis of works, salvation comes only through one’s name being written in the book of life. I mention in the message that my understanding of the book of life is that it contains the names of those who have placed their faith and trust in Jesus Christ for the forgiveness of sins. Only those with their names written in this book are saved . . . the rest are cast into the lake of fire. If judgment is on the basis of works (what we have done), then we need better works. Being identified with Jesus allows His righteous works to be credited to our account, while our sin is fully paid for in His death on the cross (2 Corinthians 5:21). Whose works are you counting on for your salvation? Your works or His work? How does this picture of judgment in the end times help you understand more about the salvation offered in Christ? Revelation 20:4-6 describes the saints reigning with Jesus for 1,000 years in His Kingdom. Have you ever stopped to think that if we trust Christ now, we get to reign with Jesus in His Kingdom? This would involve real work on the earth in our “life after death.” How does understanding that we will get to reign with Christ effect your view of life after death? Revelation 21:1-4 describes the New Heaven and the New Earth as a return to a “Garden of Eden” like experience . . . living in relationship with God, without sin, or pain, or loss. This is more of our traditional understanding of heaven. What about our current world makes you most long for this New Heaven and New Earth that Jesus promises? What do you most take away from this message, passage for your life today? In other words, how will you apply the truth talked about in part 2 of this series? So go many conversations from front seat to back in the Robinson family Truckster on any trip longer than 10 minutes. I am really getting tired of Kimberly asking that question! JUST KIDDING! Of course, these are conversations between parent and child. The child wants to get to the destination and has little patience for the journey. The parent, meanwhile, understands that to get from here to there requires planning, provision, and execution. We don’t live in a Star Trek “beam me up” world, so transit time is our reality. “Is the pain, injustice, and suffering of this world over yet?” humanity cries out. “No. Not yet,” our Father responds. “Ah man! Life is hard here. Come Lord Jesus!” we reply. What will that time look like? How do we make sure we are safe on judgment day? These questions and others will be examined this Sunday as we conclude our 2 part series “M+” by looking at Revelation 20:1-21:4. Please join us at Wildwood as we contemplate the future of humanity. Join us in either our 9:30 or 10:50 worship services. As many of you are aware, I started a short two part sermon series this past week at Wildwood entitled, “M+”. In this series, we are looking more in depth at the events that will occur in the first 1,000 years after the return of Jesus Christ to the earth, as described in Revelation 20-21. I have had a lot of dialogue with many of you about this short series, so I have decided to post the audio from the sermons here on my blog, as well as write a few questions for further reflection in case you or your small group are interested in exploring the idea further. May God bless your study of His Word! In these verses, Satan is described as a deceiver. In what ways have you seen Satan be a deceiver? Your answers can include biblical AND examples from your own experience. When Jesus returns, He quickly imprisons Satan and establishes a kingdom on the earth for 1,000 years. Do you think this is speaking of a literal 1,000 year Kingdom? Why or why not? After the 1,000 years, Jesus lets Satan out and he promptly returns to the business of deception . . . and he is successful! What does this tell you about Satan? About humanity? In 20:7-10, Jesus swiftly judges Satan permanently casting him into the lake of fire. This shows the elimination of evil (and will be followed by the “recreation of the world” into an idyllic state in chapter 21). Evil exists and negatively impacts us only for a season (even if that season is thousands of years). Compared to eternity (time without end) evil’s day is very short. How does this reality help you answer the questions you have about evil? Why do you think God allows Satan and evil to have so much swing in the world today? There are many problems in the world today. Diseases without cures, hungry children without food, villages without clean drinking water, humans being trafficked, marriages ending in divorce, wars between nations, broken systems attempting to administrate help, and many others. These problems are not new . . . they are old. After all the first family (Adam and Eve) saw one son murder another . . . and things have gone downhill from there. There are many problems in this world. In other words — He’s coming back. The full realization of the promises of God will come in the future, in events that will commence when Jesus returns to this earth. In fact, after His return, Revelation 20-21 tell us that He will reign on the earth for 1,000 years BEFORE ushering in a new heaven and a new earth. 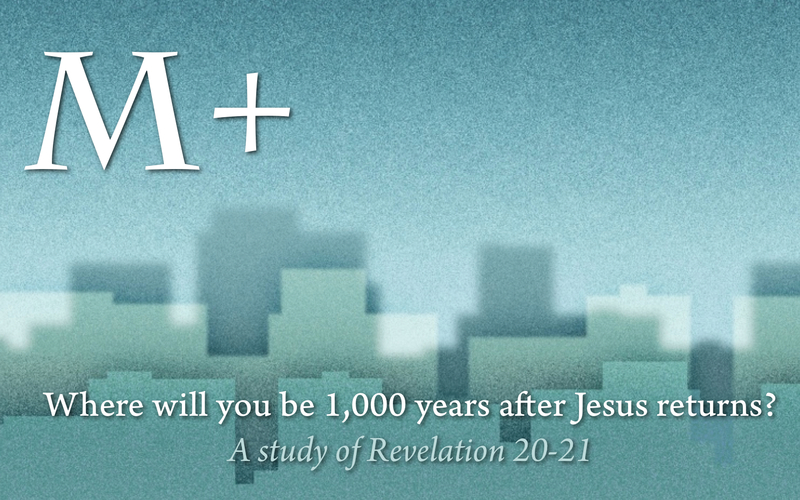 Where will you be during these 1,000 years and beyond? What significance does all this have for us today? We will be examining these questions in a short two week sermon series out of Revelation 20-21 beginning this Sunday at Wildwood. The series is entitled “M+.” Hope to see you there in either our 9:30 or 10:50 worship services. With Magua breathing down their neck, greatly outnumbered and with wet gunpowder, Hawkeye decides to take a chance. Knowing that if Magua caught him with this crowd, that a deadly battle would certainly ensue. Figuring that Magua would take the other captives back to his village before taking further action, Hawkeye decides to take a flying leap through the waterfall and run to safety. Before he jumps, however, he gives his beloved Cora a promise. “Stay alive,” he says. “I will find you!” And eventually he does . . . rescuing her from the clutches of the enemy. Three times in the last 14 verses of the Bible Jesus says, “I am coming soon!” (See Revelation 22:7, 12, and 20) These “last words” give us a clue as to the kind of encouragement Jesus felt His followers would need in the (now) 2,000 years since His departure physically from this planet. As I wonder what all Jesus hoped we would understand from these last words, it helps me to consider Hawkeye and Cora in the cave behind the waterfall. With Magua close behind, Cora had to be scared. Magua was the man who had killed her father and betrayed her family. Hawkeye seemed to be the only one who could stand up to Magua’s brutality, and now he was leaving! However, in order for Hawkeye to have ultimate triumph, it was important for him to leave her for a while before returning in victory. Before he left her, however, he wanted to make sure she knew that he would not forget her and that he would come back and rescue her . . . therefore, she needed to persevere. In this world, since the ascension of Christ back to heaven, Jesus’s followers have huddled in caves and congregations feeling pressed upon by evil forces which are fast approaching. Another friend dies. Another relationship suffers. Another sin struggle lingers on. Like Cora behind the waterfall, we find our comfort in the presence of One who has left the view of our physical sight. Before Jesus concludes the canon of Scripture, He wants to make sure that we know that He will not forget us and that He will come back and rescue us . . . therefore we need to persevere. In fall 1994, I had the chance to go see something really cool . . . and I turned it down. My roommate at the time had graciously invited me to accompany him to see James Taylor in concert at the Lloyd Noble Center in Norman, Oklahoma. Looking back on this opportunity now, I see that this was an awesome invitation, however, at the time, I somewhat blew it off. “James who?” I replied. Somehow, I had spent 20 years on this planet without ever really listening to James Taylor’s music. My roommate went on to explain to me with increasing volume what a fool I was for not knowing the music of this American legend. Sure I had heard “Shower the People” before, but I did not know who sang it. I grew up on a steady diet of 80’s hair bands like Cinderella and Def Leppard. James Taylor had two things these bands never had: a bald head and musical talent. Therefore, JT’s greatest hits album never graced my tape player. As a nearly 35 year old man, I still mentally kick myself for missing out on that opportunity to see a musical legend in concert. 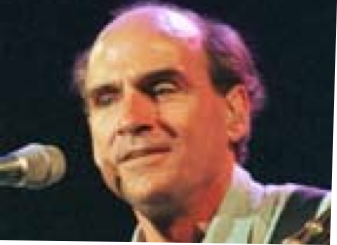 My iPod frequently kicks with James Taylor songs, and seeing Sweet Baby James in concert is on my “bucket list.” After turning down my roommate’s 1994 invitation, I began listening to Taylor’s music, to see what I was missing, and my musical taste has never been the same since. This new heaven and earth is better in every way than the world in which we currently live. It is better physically, as the streets are paved with gold and the gardens are better than Eden. It is better spiritually, as God Himself is with His people in a physical and tangible way. It is better emotionally, as every tear is wiped away from our eyes. The future that God has for His people is unrivaled and awesome. At the same time, Revelation 20-22 indicates that just as the future is awesomely great for believers in Jesus Christ, it is catastrophically terrible for all who do not know Christ as Savior and Lord. To the believer in Christ, paradise awaits, but for the unbeliever, hell is place of eternal torment. This information about the future, should fill our understanding today. It is possible that people can live out their lives right now, having received an invitation by Christ to an eternity in His presence, however, people still turn down the offer because (I believe), they do not know what they are giving up. Satan and sin have blinded their eyes (just as it once did ours) and obscured the future promises of God to mankind. Knowing what I know now about James Taylor, I cannot believe I turned down the chance to see him in concert. Knowing what I know about Jesus Christ and the future He has planned for us, I cannot believe anyone would turn down His ticket to eternity. If you do not personally know Christ as Savior, please take a moment to read Revelation 20-22 and see what you will be missing if you enter eternity without Christ. I cannot go back in time and see JT in person at Lloyd Noble . . . that date is now past. However, if you are reading this, then it is not too late to educate yourself on the future and accept His ticket of salvation by faith before your date to enter eternity comes. If you do know Christ as Savior, take a moment to read Revelation 20-22 and see what we have to look forward to in our future. Praise God for our future and remember His greatness so we never turn down His riches because of our ignorance of His good plans for tomorrow even if today seems difficult. At mile 14 I got tired. At mile 16, my foot got a cramp that I could not shake. At that point I was quite certain that I was not in the “Happiest Place on Earth,” I don’t care what the brochures and signs say! 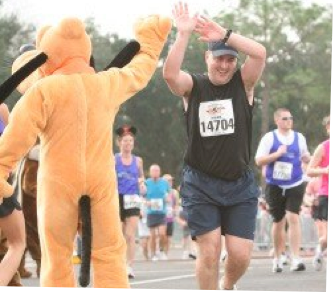 You see, in January 2008, I “ran” the Walt Disney World Marathon in Orlando, Florida with a friend. I say “ran” because the last ten miles of this race for me hardly looked like running. (Hobbling maybe, but running – no way.) The cramp in my foot forbid me from taking a full stride, and all I could do was limp toward the finish line. At the 26 mile mark, however, something remarkable happened. A marathon is 26.2 miles, so at that point, I only had less than a half mile to go. I looked up and saw the giant Epcot Center “ball” towering above me, and I knew the finish line was just on the other side, so I started to run. After an additional 3 hours of limping along, my legs hardly worked and I tried to pick up the pace, but with some effort, I was slowly gaining ground and at least looked like I was running. With about a tenth of a mile left in the race, I turned a corner and saw a 100 person Gospel Choir serenading me! Now, the conversation between Little Steve and me in the easy chair . . . that was a fabrication . . . but this 100 person choir, they were the real deal. They were singing the “Hallelujah Chorus” as they swayed back and forth to the music in their white robes. Suddenly, I was a new man. I began singing with them as I literally jumped up in the air and high fived the choir director on my way by. As I turned the final corner, I saw the grandstands filled with about 2,000 spectators cheering me on. At that point, I galloped into a full blown sprint I encouraged the crowd to “raise the roof” a la Kevin Garnett in the NBA finals. Just steps before the finish line I gave the oversized Chip and Dale chipmunk characters a full body hug before slapping Pluto’s hand and crossing the finish line. Tears filled my eyes as I remembered all the training that went into that day and the relief that all that pain was now over. In the end, I was so glad to have persevered to the finish. I tell you this story today, because in life, many get to about mile 16 and begin to “cramp up” under the stress and strain of this life. Years of illnesses, death of loved ones, fractured relationships, financial struggles, world wars, sin struggles, addiction, and other problems have left us weary and wanting to give up. Sometimes we may even have simple conversations in our heads about the value of continuing in the Christian life. “Keep the faith,” the angel on our right shoulder declares. “Give up and just entertain yourself,” the red suited man on your left scowls back. Even if we do continue to walk with God in this life, sometimes we feel like we are limping towards the end. If that is you, or if that is someone you know, then remember something: the finish line of this age is even more grand than the grandstands at Disneyworld. Revelation 19:11-21 describes for us the climactic and triumphant return of Christ at the end of the race of life. When Jesus returns, He will return with the armies of heaven riding white horses and wearing white robes . . . and it is a large army! If I thought the “Hallelujah Chorus” was impressive at the Epcot ball, how much more so will it be to see the multitude of heaven returning to earth. Far better than seeing Pluto and the chipmunks at the end, at the finish line of this age, we will see Christ Himself. As I read Revelation 19, I am struck by the fact that when Christ returns and helps us cross the finish line into His Kingdom, we will be ecstatic. I am sure that tears of joy will fill our eyes as we reflect on the fact that we have walked with Him through many years of “training” and rejoice in the fact that the pain of this life is now over. If you are limping along in life right now, read Revelation 19:11-21 and remember the finish line that lies ahead. Knowing it is there should give us the courage to pick up our pace and carry on. In the end, we will be so happy that we have persevered. Spring Break 1994. It was 5:00 AM, and we were a twelve hour drive away from our destination: the snowy slopes of Crested Butte, Colorado. I had never been to Crested Butte before, but I was in luck. 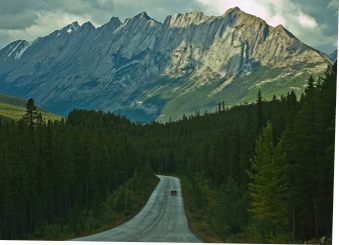 One of the other guys who was going on the trip had grown up vacationing at Crested Butte and would be leading the three car caravan all the way to the top of the mountain. After everything was loaded up and ready to go, we all pulled out from our Norman residence and headed west. Three cars in all, following the tail lights of the Big White Yukon wherever it went. These were the days before Google Maps or GPS navigation. Heck, I did not even have an atlas in the car with me. My only map was the mind of the driver in front of me, therefore, I was determined not to lose him. My only problem was that I think he was determined to lose me. My guide hit the town moving fast . . . then sped up. To make matters worse, we did not have cell phones, and a thick fog was rolling in. If I wanted to get to Crested Butte that night I had to either keep up or buy a map. Since buying a map is akin to declaring failure for the average man, I sped up and tried my best to keep the tail lights in view. We went through small towns and unmarked dirt roads (I kid you not), as we headed to Crested Butte. Our guide had been there many times before and knew the short cuts all the way there. In the end, we made it . . . and I am glad that we did. We enjoyed four days of powdery white snow at an amazing ski resort: quite a prize for simply keeping up. I was thinking of this story today as I read Revelation 14:1-5 and saw the description of a particular set of faithful men and women who will live on the earth in the last days before Christ’s return. These people (144,000 in all) are described in 14:4 in this way, “They follow the Lamb wherever He goes.” Knowing their great need. Knowing that they desire to spend eternity in paradise. Knowing that they do not know or have the ability to get there on their own, the 144,000 are said to stick with the One who knows the way. The One who had grown up on this earth and lived the perfectly righteous life and who now resides in heaven: they have chosen to make Him their guide. Where He goes, they go. Where He directs them to stay they stay. What He directs them to do, they do. They have no other map to navigate this life, so they will follow Him, their living map, wherever He goes. What a joy it is for them as they do this! They actually (according to 14:3) get to sing a song to the Savior that no one else knows. This seems to be an indication that because of what their Savior, the Lamb, has done for them specifically, they have praises to sing that no one else even does because they have followed the Lamb down certain paths and seen Him do certain things in their everyday lives. They followed the Lamb and it was worth it. We can learn a lot from the example of these 144,000. We also need help navigating our journey through this life to our final destination. We also desire to spend eternity in paradise and have a special song of personalized praise to sing to the King. If we desire that, then our task is the same as this future population: we need to follow the Lamb wherever He goes. Sure, we cannot see Him with our eyes, but He has given us some tremendous resources to know His direction so that we might follow Him through the fog of our lives. He has revealed Himself to us through His Word, the Bible. We know His character and the kinds of things He is about by reading what He has revealed to us from Genesis-Revelation. Knowing that He never changes gives us the confidence that He will not suddenly decide that “Colorado is East of Oklahoma.” Just as Colorado is always West of here, so Christ’s truth never changes. He also reveals Himself to us through the inner testimony of His Holy Spirit. The Spirit rests on Christ and can lead us in the directions that God desires that we go. Galatians 5:25 tells us that it is God’s desire that we “keep in step with the Spirit” and His leading in our lives. In a sense, this is reminding us to “keep His tail lights in view” as we speed through the world in which we live. I was convinced that my friend in 1994 wanted to lose me on our journey west. As I read the Scriptures, I am convinced that Jesus wants to keep us close as we blow through this life: Following Him wherever He goes. OK. Be prepared to call me a geek. I deserve it. Why? Probably for many reasons, but let me give you one more: I am a giant Star Wars fan. It’s true. I grew up in the 1970’s/80’s and like many people during that time I was a big fan of those big movies. Now, the latest three movies were good, but for my dollar you just can’t replace “A New Hope,” “The Empire Strikes Back,” and “Return of the Jedi.” Ewoks excluded, those were awesome movies. Now, as long as I am clearing the air about this, you need to know how deep my Star Wars fixation went in my early days. I woke up every morning in my Star Wars underoos in my Star Wars wallpapered bedroom, walked past my collection of Star Wars toys to grab my Star Wars lunch box and head off to school where at recess, someone was probably going to be called “Chewie.” Yes, it ran that deep. What is the fascination about these movies? Is it the special effects, the colorful characters, the imaginative settings, or the deep voice of James Earl Jones as Darth Vader? Yes . . . but I believe there is an even deeper reason for our love for these classics: the storyline. If you are like me and you like stories with clear moral lines drawn, then you will love the story of Revelation 12:1-13:1. In this one chapter, God flies over the top of history to give us a “Star Wars” like good guys vs. bad guys story that George Lucas wishes he could copyright. In this story there is a woman who symbolizes God’s people, Israel. She exists in the world and is about to give birth to a Son, Jesus, who will one day rule the earth. While she is preparing for the birth of the child, a war breaks out in heaven. In this war, an evil dragon, Satan, fights against the good angel Michael, and is defeated. The defeated dragon falls to the earth taking a number of storm troopers, (uh, I mean) angels/demons with him. Though the dragon was defeated in heaven, he hopes to prevail on the earth, but every effort he takes ends in defeat. He tries to eliminate Jesus, but cannot. He tries to accuse the followers of Jesus, but because of Christ, the accusations do not stick. He tries to eliminate Israel all together, but God protects His nation. This is a classic interaction! On a cosmic scale, we have the all time greatest good vs. evil story . . . and good triumphs at every turn. What makes this story even more amazing for us is that it is all true. Though it may read like science fiction (read Revelation 12 sometime . . . it is certainly more interesting than I just described), it is all true and unfolding history. What is great is that this is a story with no cliff hanger. At the end of the day, we will not hear that the dragon is our father. Our Heavenly Father is the One we belong to, and He will win the day. That is why we should stay with Him. Satan is regularly defeated and he does not take it well. He is quite angry and stands on the edge of our lives beckoning us to come over to the dark side. However, knowing how the story ends, that would be a stupid move. 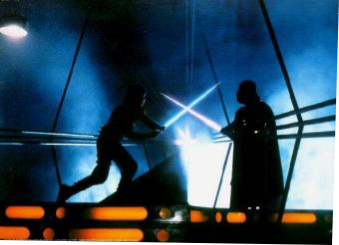 Anyone who saw Anakin become Vader in Episode 3, had to be thinking, “That is not a good decision young man. One day, you will regret dawning the black cape. It does not end well.” Reading Revelation 12 ought to be encouragement to us to stay the course with Christ knowing His victory is assured and Satan’s defeat has already been decided. In the world in which we live, to our eyes, we often see more gray than black and white. Reading passages like this correct our vision and remind us that on the cosmic stage, the war among the stars has already been won.